Are your wishes legally protected? By making a Will, you are simply ensuring that your final wishes are legally recognised. 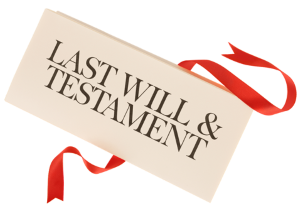 More importantly though, writing a last Will and testament gives you the certainty and peace of mind from knowing that your property and possessions (also known as your estate) can be passed on exactly as you want on your death. Without a Will, the state decides who gets what from your belongings and how much, so those who you would want to benefit may get far less than you hoped. Like most people, you might assume that your property would automatically go to your spouse and children on your death. In fact, their share would be decided by the laws of intestacy which could mean a potentially long and expensive probate process for those hoping to benefit from your estate. Should you always use a solicitor? A legally valid will does not require a solicitor to draft or witness it. You can write your own at any time but it can only have power in law if it is drafted and signed correctly and is up to date. 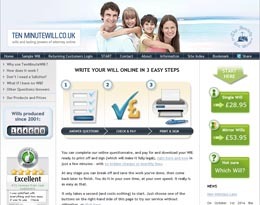 There are books available to show you how to create a Will and some popular online Will writing services such as Ten Minute Will which have received positive reviews from customers. However, proceeding without a solicitor is really only viable if your affairs are straightforward and even then it is adviseable to have a professional check your Last Will and Testament for any mistakes. If your circumstances are complicated, involve a business, or there are numerous family members likely to make a claim, you should always get expert advice. If cost is deterring you from using a Solicitor, there are some cheaper online services that employ Solicitors to check all Wills produced such as My Lawyer who even offer telephone advice from legal professionals as part of the service. If your affairs are straightforward, an online will writing service may save you time and money. The best online services employ professional will writers to check the final draft of your Last Will and Testament and ask you a series of specific questions about your affairs. Using your responses, your document is drafted, either online or through the post, from appropriate legal paragraphs tested by precedent. 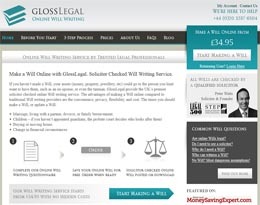 Two popular online Will writing services are GlossLegal and Ten Minute Will. Both use professionals to verify the legal validity of their Wills and provide a range of supportive information during the process of drafting a will. Whilst there are some good online services that make the process quick and simple, you should be extra careful as a poorly drafted document is almost as bad as having no Will at all. 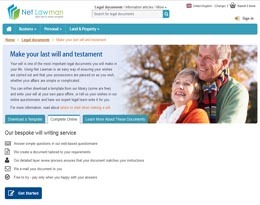 If you are in any doubt about creating Wills online, consult a Solicitor, or a member of the Institute of Professional Will Writers who can advise you. Is it up to date? When you write your own Will it reflects and enforces your wishes at the time it is drawn up. As life goes on and circumstances change so might your wishes for how your assets and belongings are distributed on your death. 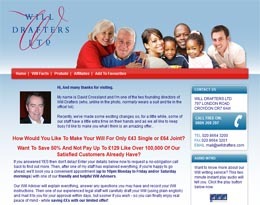 Still confused about making a Will? 70% of people still fail to confirm their wishes by writing a Will. Leaving your family with uncertainty, expense and probate delays would not be a welcome legacy for those left behind. The internet and new online Will writing technology now makes it easier and cheaper than ever to secure your final wishes. That said, there are a growing number of options for writing a Will, particularly online. 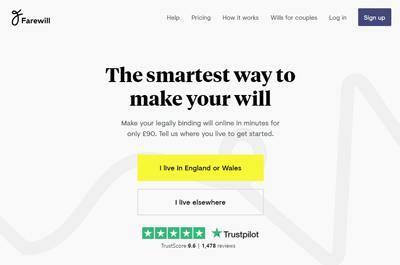 So to help you, we have created a simple ‘Will Selector Quiz’ which can help you narrow down the options in just 5 clicks. To get started just click the button below.